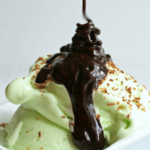 Once again I turned to "I Breath I'm Hungry" for a wonderful sugar free mint ice cream recipe. While you can make this without an ice cream maker, it's oh so much easier if you have one. Enjoy! Combine all other ingredients in another bowl. Add to heated cream and stir until combined. Microwave for one minute. Stir. Microwave for 30 seconds, stir. Microwave for another 30 seconds, stir. (Don't try to do this all in one step or you'll end up with sweet green scrambled eggs. Trust me on this.) Alternatively you could heat it in a saucepan until thickened but be very very careful not to overcook it. You can add bits of dark chocolate or cocoa nibs in the final minutes of churning if you want. Or shave dark chocolate over it and drizzle sf chocolate sauce over it before eating like I do (I hate giant chunks of frozen solid chocolate in my ice cream but that's just me!) However you eat it, it's delicious! Creamy and smooth, just the way ice cream should be! Mmmm....mmmmmm....good!